While Deadwood Season 4 was often teased, it never happened. And ever since the show went off the air, HBO and its creators have been teasing a Deadwood reunion movie. Now, it appears that a revival is closer than ever to happening. According to one of the original stars, HBO officially has the Deadwood movie script in their hands. So when will it move forward and go in front of cameras? Ah, that's the million dollar question, isn't it? It has been more than 10 years since Deadwood aired its series finale. And ever since that time, fans have been wanting more. Interest has never waned, growing only stronger over the past handful of years. 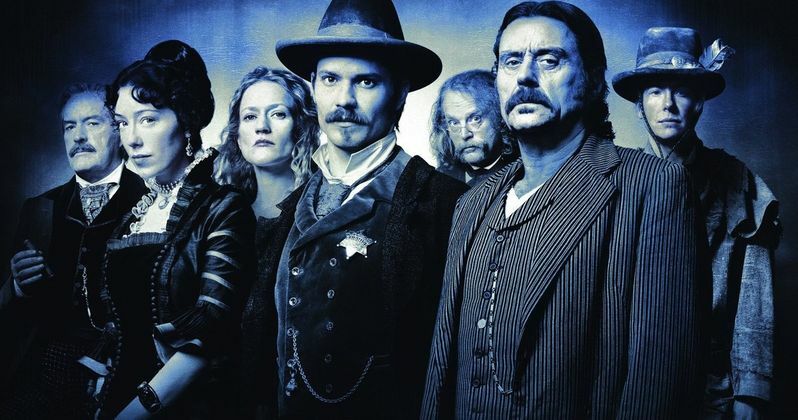 The Deadwood movie project has been gestating for what seems like an eternity. But now, according to Al Swearengen himself, we're closer than ever to actually seeing it happen. The Deadwood movie script was written by series creator David Milch. It is locked in for a two-hour runtime. And it is currently sitting in those shiny HBO offices waiting to be filmed. Says Ian McShane, who broke out as the foul-mouthed Swearengen, about the show's progress in creeping towards becoming a bonafide reality. "[David Milch's] two-hour movie script has been delivered to HBO. (laughs) If they don't deliver [a finished product], blame them." Ian McShane has been on the press circuit as of late, promoting his role in the upcoming Stars series American Gods, which premieres April 30. He claims to have spoken with David Milch about 'some of' the script. But he's not quick to divulge any plot details. And he doesn't give us any kind of update on where Al Swearengen is a decade later in his life. Last we saw, he was hedging towards a career in acting on the stage. At that, the entire surviving cast of Deadwood still looks pretty good, and could play younger if needed. There is no indication that Deadwood will pick up a full ten years after the original. About returning for the show, McShane offers this. "I'll be seeing him for lunch [soon]. We'd all love to do it... It would be nice to see all of the old gang again." It appears that Milch got a surge of inspiration, as the Deadwood movie is much further along now than it was at the beginning of 2017. Back in January, during the TCA Winter Tour, HBO's top programming executive Casey Bloys said this to TVline about any progress on the project. "I know [Milch]'s working on it. But I have not seen anything yet." Before that, a full year had passed since Bloys' predecessor at HBO, Michael Lombardo, first confirmed that the movie was actually happening. It was recently announced that David Milch is also helping bring True Detective Season 3 to HBO after Season 2 almost completely derailed the series from continuing. HBO still hasn't green lit more episodes of True Detective, but the first two scripts are completed, and the team is moving forward. Deadwood aired on HBO from 2004 to 2006, spanning three complete seasons before being canceled by HBO. David Milch had always planned to do two Deadwood movies to properly end the show and the rivalry between Sheriff Seth Bullock (Timothy Olyphant) and foul-mouthed pimp Al Swearengen (Ian McShane). The show is extremely expensive to produce, and Milch had trouble over the years reassembling his impressive cast, all of whom went onto bigger, perhaps not better, things. If everything works out, we could see the Deadwood movie, which will air on HBO, debut by 2018.